Lt Gen Praveen Bakshi, AVSM, VSM, GOC–in-C Headquarters Eastern Command arrived at Umroi Cantonment on 18 May 2016 on a two days visit to Meghalaya and Assam. He was received by Lt Gen D Anbu, AVSM, YSM, SM GOC GAJRAJ Corps at Barapani Airport. The Army Commander was updated on prevailing security situation in Assam, defence preparedness along the borders and also on efforts being made by the Army to coordinate disaster management plans with the civilian administration. The Army Commander was also briefed by Maj Gen Rajeev Sirohi, VSM the GOC of the Red Horns Division under GAJRAJ Corps on the conduct of a Disaster Management exercise that includes all the stake holders in GAJRAJ Corps with representation from National Disaster Relief Force (NDRF) and the civilian administration of the State of Assam. 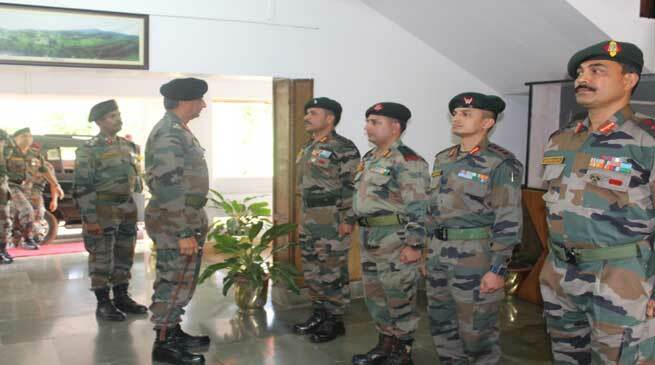 The Army Commander also visited local units and formations at Umroi Cantonment and interacted with the troops and was briefed on the military training undertaken by various units. The Army Commander shall be proceeding to Jorhat on 19 May to continue on his tour of Assam.